Confined space like crawl spaces and manholes are not designed for constant occupancy; they can be difficult to exit if an emergency occurs. Workers in confined spaces can be subjected to hazards including electrocutions, explosions, and toxic substances. OSHA has had a general industry standard for confined space entry for quite some time now, but their rules for construction in the past have been vague. However, construction workers can perform a multitude of tasks in confined spaces that can pose a great threat to worker safety. On May 1, 2015 OSHA remedied this by finalizing the final rule for confined spaces in construction, which discusses training requirements, and permit programs designed to protect workers exposed to physical and atmospheric hazards. Much of this new rule repeats language from other safety regulations, but is still noteworthy in discussing. 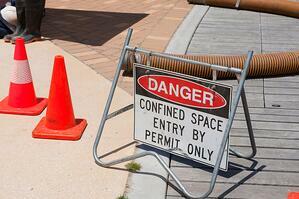 Workers must be aware of where confined spaces are located. They must also have proper postings of danger signs and areas where proper permits are provided. There must be a written process between the employer and worker who enters the confined space. A written program must be implemented prior to and during any confined space entry operation. All workers must leave the confined space immediately. An evaluation must be done on the location to determine how the hazard developed. Employers must take precautions to protect workers from the hazard prior to anyone reentering the space. Be maintained for record keeping. OSHA law requires employers to provide workers with a safe work environment. For more information, OSHA has also released three new fact sheets available for download. For more information on confined space training and other ways of bettering your safety culture download our safety manager’s training guide to safety training.